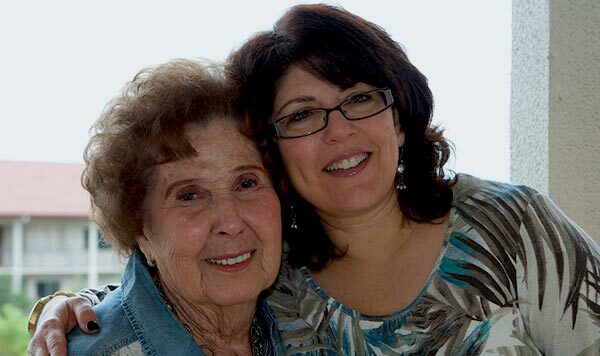 Jewish Family Service of Broward County, Florida provides Rosa with homecare and other essential services. The agency receives a grant from the Claims Conference to assist Nazi victims. Rosa Lindenberg and her husband, Leo, both Holocaust survivors, did everything they were supposed to do to save for retirement and their old age. Unfortunately, due to Leo’s prolonged illness, the couple depleted their savings, and Rosa must now rely on the Jewish Family Service of Broward County, and the Claims Conference, for food assistance and homecare aid. Rosa was born in Wuppertal, Germany in 1924. When the war started, Rosa’s mother paid a German woman to smuggle the little girl to Belgium. Young Rosa stayed with her uncle, and then with family friends for several months, until she received approval to join the Kindertransport in August 1939, which brought her and 7,500 other Jewish children to safety in England. After the war, she found out her parents were murdered in Auschwitz. In 1949 Rosa married Leo Lindenberg, the son of the family friends she had stayed with in Belgium; the boy had survived the Holocaust hidden with a Christian family. They came to the United States in 1950, and were together more than 60 years until his death in late 2012. Rosa suffers from severe back pain, the after-effects of a broken back and spinal surgery a few years ago; heart problems and balance problems. The couple spent their life savings on medicines and treatment that were not covered by Medicare for Leo’s illness. She didn’t expect to live this long, Rosa admits. Now 89-year-old Rosa struggles. Rosa receives eight hours a week of homecare help from JFS of Broward County, through allocations from the Claims Conference, which has made it a priority to help elderly survivors live out their days in dignity in their own homes. She also receives a monthly food package, emergency financial assistance, medications, bathroom safety equipment and an emergency monitor. Rosa expresses her appreciation for all that JFS and the Claims Conference has done for her since she began receiving assistance in 2011.